Danny Sullivan, Search Engine Land’s editor in chief, is this afternoon’s moderator. That says something about this topic’s significance to current trends in the search marketing industry. 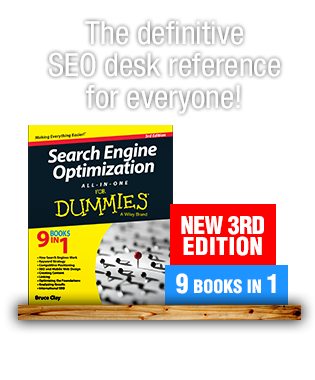 Sullivan says that in the old days, we used to fire up the Overture keyword tool or the GoTo keyword tool and see all the words people were searching for. What’s the joke about the SEOs that walk into a bar? a pub? a watering hole? As we know, the data given by a straightforward keyword tool isn’t enough today. 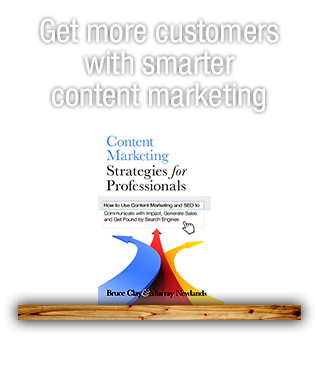 You have to combine many approaches, getting to the audience and intent with different kinds of tools and data available to marketers today. Kate Morris started in this world in PPC. It was keyword heaven. You knew exactly what everyone was doing all the time. Now, 100 percent on the organic side, the past three years have been so different, and the biggest thing has been the change to keywords and how to approach them. Here’s how to deal with them. First, definitions. Keywords (query) and concepts (topic, info that you’re looking for). Search engines are moving from relying on just the query to using a number of data points to determine the best results. The query doesn’t tell the search engine everything. Geolocation, personalized search, this has been going on a long time. Now there are device types, schema — a lot more being fed into the big machine to get the best results. The old process was very specific to keyword-specific things, and the problem with that today is that you can’t report on keywords. Keywords don’t translate to the bottom line. 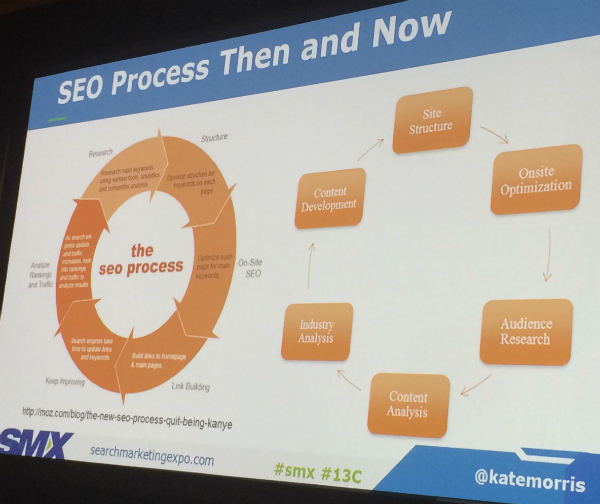 And the process has changed in a way that starts with site structure and optimization. The technical details are so important; SEO will never die because sites ban crawling or set up redirects wrong, have duplicate content, etc. Has anyone in here been an in-house SEO for the same company for more than five years? One person in this room of 100 raises their hand. It’s very rare. Lots of people touch a project. Mobile Internet Usage! So much higher than everything else. Facebook the app has a lot to do with that. Think of all the apps that connect to the Internet. That’s part of the volume of time spent on the Internet. 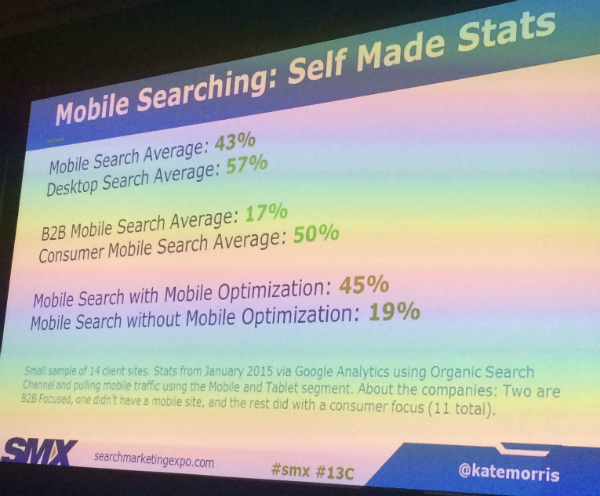 The question for SEOs is how many people are searching on mobile. Morris went looking for these numbers and couldn’t find them. She even asked a Google employee. So! She took a sample of data from her clients (14 sites) to get some kind of data. Here’s the breakdown of her sources. Note that the B2B data is only two sites. The announcement a few days ago about Google using mobile friendliness as a ranking signal for mobile search shows that. 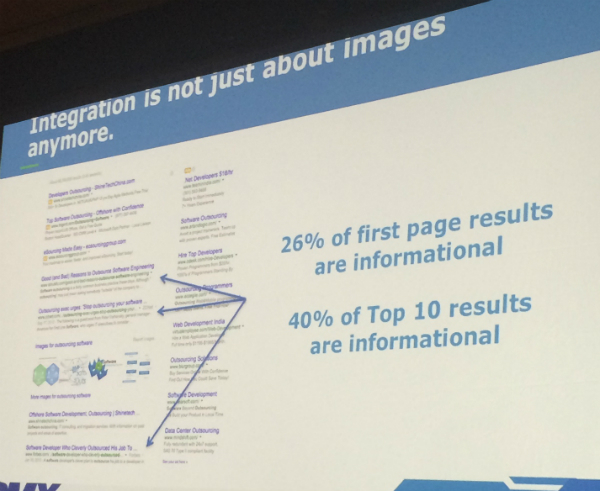 Google says that about 25% of queries have a Knowledge Graph result. Longer results pages. She’s seeing search results pages with 100 organic results on the first page. Search engines are identifying if a searcher needs information or a service. Google will try to present both types of results. For the query “buy a house” — it has a transactional word in it, but people aren’t buying houses online. 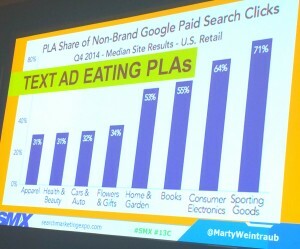 89 percent of first page results are info; 70 percent of top 10 results were serving purchase behavior. Who counts how many times a world shows up on a page? Morris took the top 10 terms in the slide above. Tweet at @katemorris if you want to see the full Excel sheet of data. Result: Capital One. 10/10 Page 1 rankings. One keyword variation in title, three keyword variations on page. Result: Bank of America Calculator: 10/10 Page 1 rankings. One keyword variation in title. Eight keyword variations on page. Result: BofA product page: 3/10 rankings. Three keyword variations in title. Six keyword variations on page. Result: Bank Rate article: 6/10. One kwd variation in title. Three variations on page. There’s not a common trend. Conclusion: You still need to know keywords as a pro, but on-page keyword optimization isn’t as necessary. Search engines need data for this to work. You have to supply that to be included. Help them help you. The way people make money on the Internet is getting in before the market is saturated. 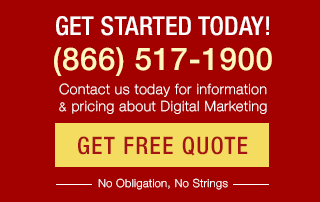 Google says that it does not use markup for ranking purposes but it can affect how much traffic you get. A Searchmetrics study of sites show that with schema, on average, they got better positioning in SERPs. We all cried after [not provided]. Search engines went, “meh.” 85% of traffic is not provided. What irritated her was that when you went into Google Analytics, the Keywords had gone missing under Campaigns. Focus on the demographics, interests and cohort analysis data. That’s the stuff you need to start knowing. Google is trying to give that to us. Marty Weintraub, up next, will get into this. Know that what Google is going for in all these changes is to answer people’s questions and give the best results possible. They want more search share. Fighting spam is another strong reason behind the changes. Oh yeah, and money. Of course. Our world changes all the time. Take a breath. It hasn’t changed that much. 1. Work on goals. 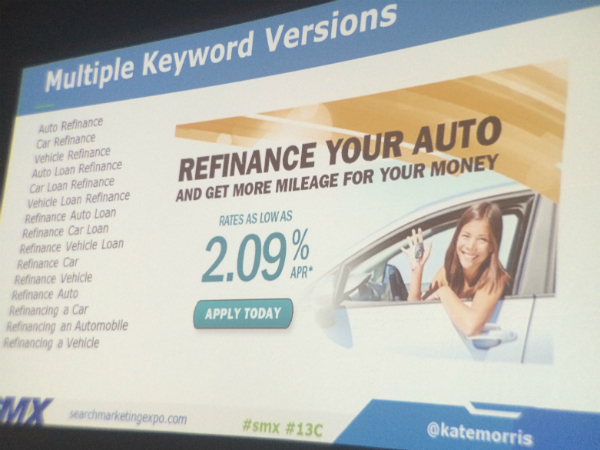 Company specific goals, not based on keywords but centered on traffic and conversions. 2. Seen this? 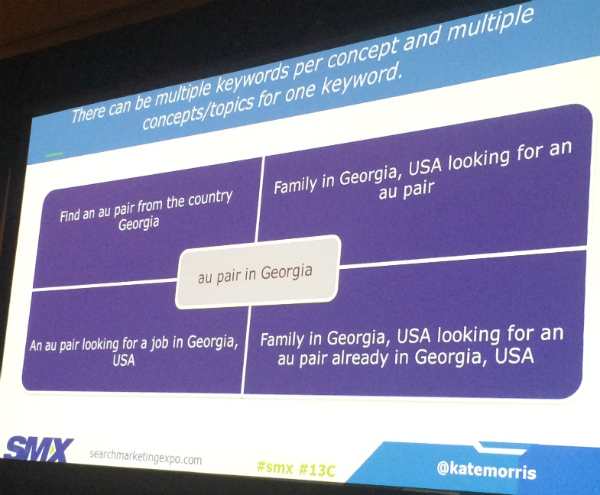 Dana DiTomaso’s video from MozCon2014. 3. Don’t stop doing keyword research. It’s still one of the best pieces of info you can get regarding what people are looking for. 4. Think about user intent. If a keyword doesn’t match what you offer, don’t worry about it! 6. Mark up all the things. 8. 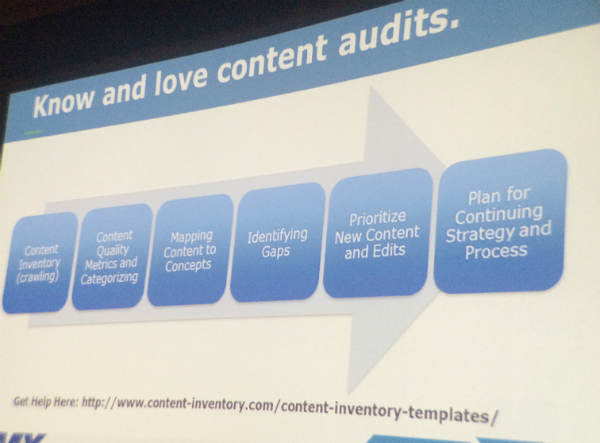 Get to know and love content audits. Rest in Peace Precious PPC Keywords? Marty Weintraub is up. He says Google has been trying to take away keywords for years and years. The good news is that everyone who has been learning to sell with psychographic data, you’re in heaven because you can sell with this stuff. Google has been on a pogrom to depreciate granular keyword data, what we see and what we can use to target for years. Now we have to use the Force — put on the blinders and feel it. Here’s a tour of targeting in display networks and the data you can get from it. Punchline: THINK LIKE A SOCIAL MARKETER. In the age of disappearing organic keywords, use paid keyword data. 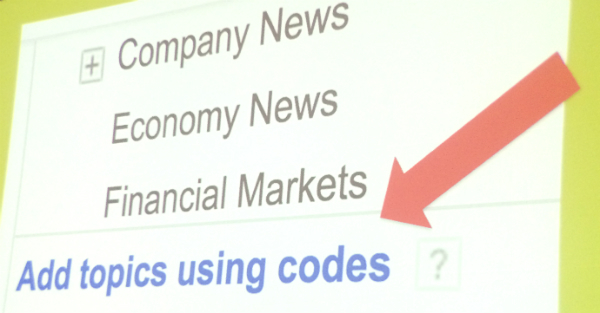 Click into the topics code list from Google Display Network. Facebook has the equivalent. support.google.com/adwords/answer/156178 — an outline of the taxonomy of topics. Google gives this to us, whereas Facebook doesn’t. Look at in-market audience in AdWords. This is about people actively looking to purchase things. Keep in mind that Google is a search engine. They tap deeply into what people are searching for. Google made affinity audiences to support TV advertisers. If you advertise on TV, look at affinity audiences (ex: bargain shoppers, winter sport enthusiasts). Clearly the application is beyond TV advertisers. There’s an exciting new button “Create custom affinity” at the bottom of affinity audiences. Google says they’re factoring in consumers’ most recent passions and ongoing interests — they use all the data and line up the audiences to categorize users in various ways. 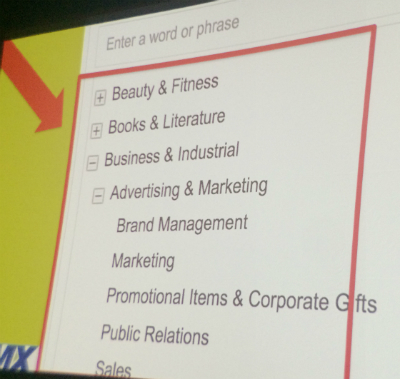 Google wants you to put in at least five URLs and interests (combined!) to create a custom affinity audience. The more you add, the more discriminating the data. Even if you never run an ad on Google’s network ever, you use this AdWords tool to discover your audience. This is your new content keyword research tool because it clusters the themes of your searchers. The takeaway is that the psychographic marketer is in the Google role now. 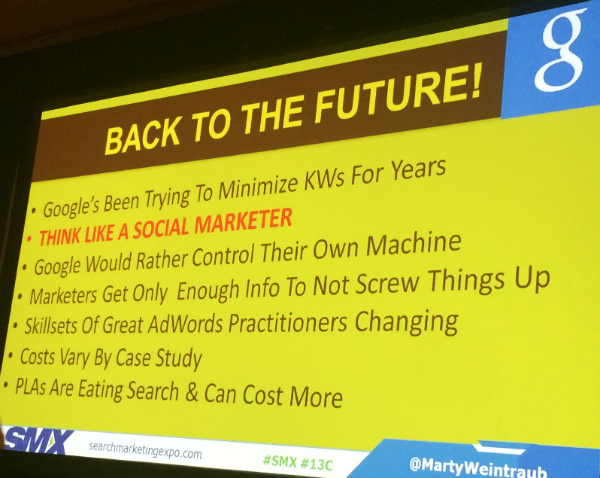 Let go of the keywords and think like a social marketer. Make audiences just like you do in Facebook. When you market your content based on and amplified by data like this, you introduce people close to the sale. Then you remarket to them to capture the rebounds. You can use this data for Google+ post engagement ads. In Facebook you’re limited by what’s there — the interest or behavior is there or it’s not. 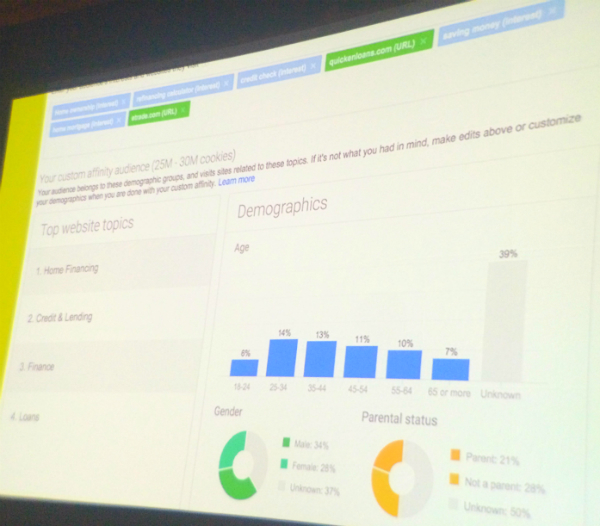 In Google, you can type anything in the box and Google will tell you about the demographics (age, gender, parental status) and the top websites on the topic. Note: This is highly vertical dependent and won’t work for everyone the same way. 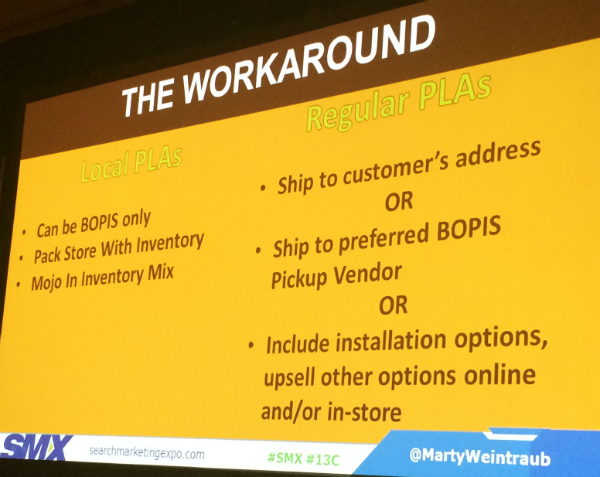 You can’t market services with PLAs. Inventory has to be verifiable by Google real-time. Buy Online & Pick Up in Store (BOPIS) is the only ecommerce option. Inventory can be verified at the regional or warehouse level if you deliver it to the buyer’s home. Put up a Magento site. Test it in store. The level of employee required to run Google’s machine is going down. Creative is going to be the driver and difference maker. Your job is about maintaining the machine. 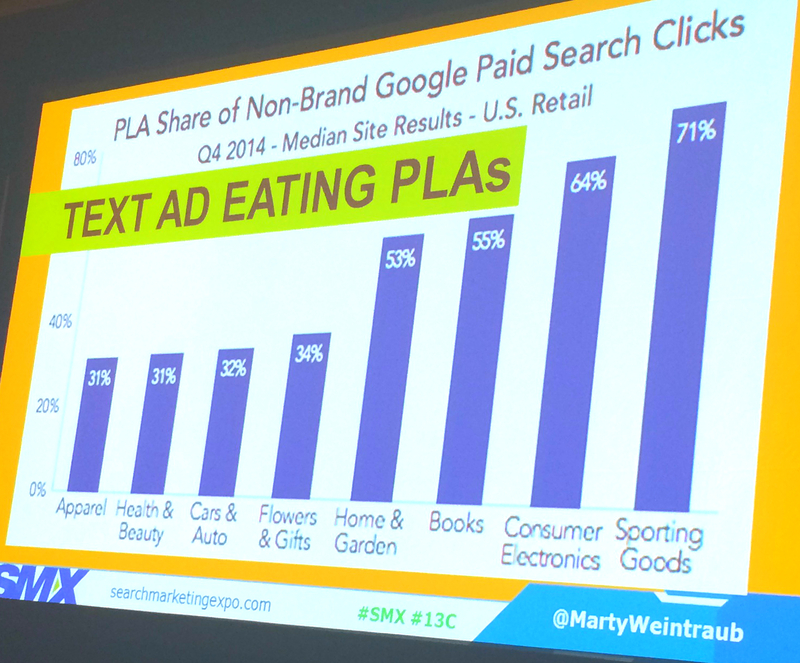 Know the evolution of search ads, contextual targeting, PLAs, custom affinities. If you’re someone who wants to dress up like a furry, you can target your people! Audience question: How do you silo based on concepts and not keywords? Weintraub: For years in social media we’ve been crafting content based on the audience. Look at the proportional interest for combinations of psychographic audiences. Look at how many cookies are available on Google to market to the proportional audiences. 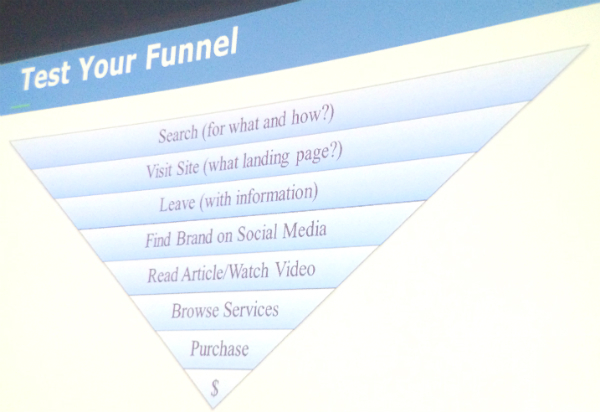 Advise organic content strategy based on audience available on paid. Morris: Marketing is applied psychology. We have to understand what people are looking for by taking certain inputs. If you take a lot of input on the form of phrases into the paid keyword tool, it will categorize it. How will the content you’ve made, your competitor’s content, investigate what people are searching for — not easy to answer and why we’ll continue to have jobs.